In grass and lawns, mainly urban areas. This small tan to buff-coloured agaric is rather nondescript except when it forms fairy rings. Apart from the umbo, the tan cap quickly dries to pale buff. 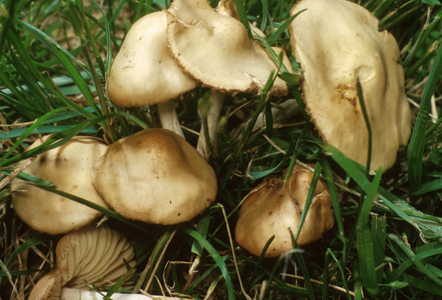 This species has thick, widely-spaced, cream gills and a characteristically tough, pliant, two-tone stem.